Everyone is jumping on the VR bandwagon, so I must admit when I received an email from Aegis Data about Virtual Reality to showcase the physical potential in data centres, I was suspicious. In order to learn more I popped a few questions over to CEO, Greg McCulloch. His lightly edited responses are published below. This sounds like a gimmick, how widely do you think it will be used in future? In the growing innovation and technology-driven society we live in, the use of Virtual Reality in the data centre can almost be seen as a natural progression towards realising new ways to enhance services. Some data centres have already begun tapping into the potential of this technology by using VR headsets to provide visual tours of a site. VR can be used throughout the data centre for a variety of tasks, from exploring architectural designs to showcasing features to potential clients that couldn’t be highlighted normally. Is it being used at the moment? And if not, what time scale are we talking about? Currently, it’s only being used on a small scale as the technology continues to mature and develop. As time goes on, the technology will be utilised more, especially as a good sales tactic for both existing and potential new customers. Over the course of perhaps six to 12 months the technology will be become more prevalent and we will really start to see its uses for the data centre coming into play. Can VR really quell security fears when most security concerns are around data rather than physical access? While data security is of course important to customers, to explore data breaches through VR technology may prove difficult. Instead, the VR technology will be able to show the physical security measures of a site in terms of its network, infrastructure, cabling and other data centre components. For peace of mind for customers, compliance to ISO regulations can offer strong indication of the safety of a site, which combined with the visual walkthroughs, should hopefully alleviate some of the concerns on data. What group of people will this be most useful to? 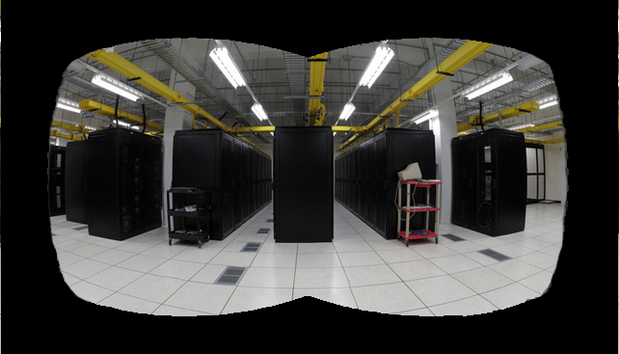 The appeal of using VR to explore a data centre encompasses a wide range of people, from the organisation itself through to the end user. The IT Director, global DC managers and operators and CIO will all be interested in the way in which VR technology can be used to envision a data centre site. For customers, it will help provide an initial overview of the site to tick enough of the boxes so that they can make informed decisions about the site. It is also a useful tool in helping end-users organisations save money on expenses and time, as potential customers would not be required to make initial trips to see a site. Some early discussions with customers for possible implementation 12 to 24 months down the line, and discovering the site through VR technology can help a data centre be placed on a tender process.